Experiments in using aromatherapy to enhance photographic skills. Hypothesis: Different aromas can affect our photography by altering moods and thought processes. Methodology: Use of essential oils on an adhesive pad on the back of the camera so the photographer will be smelling the scent during photography. This is especially so when the photographer is spending long times with his/her eye up to thviewfinder. 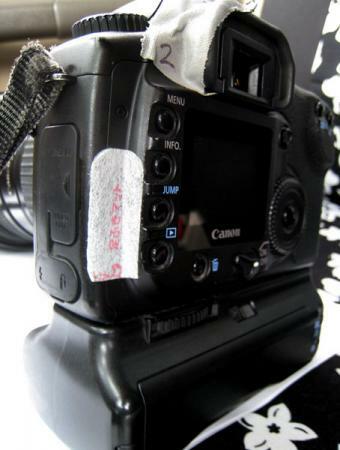 The white scent pad on the back of a Canon 20D which has been infused with Juniper Berry essential oils. Just a drop of oil. *Note: I got the idea for this when I was shooting a soccer game and I noticed my camera had a chocolate scent to it. This was unusual, especially since I haven’t bought any chocolate lately and there’s no chocolate in my car or camera bag. Then I discovered a chocolate flavored sweetener in a plastic bag had infused though the plastic onto the camera. It was a pleasent scent but I wasn’t sure if it was helping my shooting at all or just distracting me so that’s why I decided to try out this little experiment.